If you’re trying to eat Paleo without breaking the bank, cabbage should definitely be on your grocery list: it’s often as cheap as 30 or 40 cents a pound, and it keeps for weeks in the fridge if you can’t use it right away. But after a certain amount of cabbage, it can start to seem pretty bland and boring – something you have to eat rather than something you want to eat. 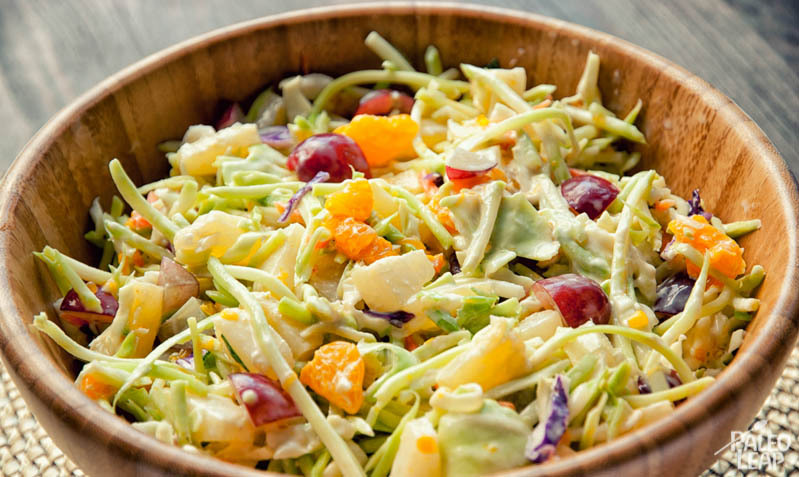 If you’re stuck at that stage, this fresh twist on coleslaw is a juicy, fruity way to jazz up your cabbage a little and make it exciting again. Cheap and tasty: what could be better? Try cheap, tasty, and nutritious. 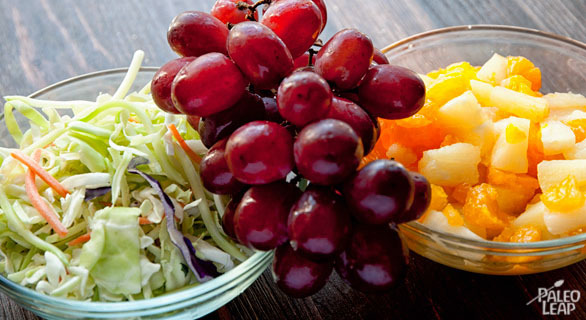 If you’re serving this salad to approximately 6 people, then each lucky diner is getting almost half the optimal daily amount of Vitamin C, plus smaller amounts of manganese, potassium, Vitamin K, folate, and Vitamin B6. Add the fat in the mayo to help you absorb it all, and you’re looking at a delicious plate full of nutrients your body needs. It doesn’t get much easier to make than salad, but if you’re so pressed for time that you can’t even cut up your cabbage, you can cheat a little by buying prepackaged bags that are already shredded. It won’t be as cheap (since you’re paying someone to cut it for you), but you’ll get a side dish on the table in 5 minutes flat. And if you want even more color in the mix, don’t be afraid to add in some red cabbage as well. Top off “cheap, tasty, and nutritious” with “colorful” as well, and it’s a surefire way to pull you out of a cabbage slump, or make sure you never even get into one in the first place.